The ideal promotional product for someone with a table is table top or desk top item. There should be utility for the product and because of that the product is also called utility product. 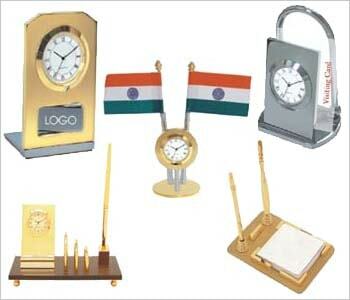 Table clocks, mobile stand with pen stand and provision for slip pad is an ideal table top gift. Depending on the audience you can design or decide the utility by adding or deleting the various options available as table tops. Stock market prefers to gift bull as symbol on table top product to encourage the recipient to behave like a bull when markets are going up. Similarly laughing Buddha is an all-round gift for the customers by the bankers as they would like to avoid projecting with any particular religion sentiments by being neutral. At the same time at Ganesh festival companies give idol of Ganesh and at Eid times they provide Holy Quran to wish and participate with the respective communities. Invariably when you would like to know the exact time during the day or night you will look at the table clock which can be put on the table in combination with pen stand or some other utility promotional product. You can have table clocks plastic casing to match your brand colour to ensure that audience connects with your brand. The needles can be changed with your miniature products to impress the viewer and to get in to his mind instantly. The limit to various use of this promotional product is limited to your imagination and your team’s innovation to capture attention of more consumers for your products. 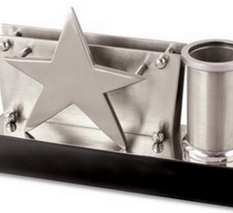 Ash trays, paper weights, various stationery items like staplers, punching machines, paper cutter, scissors, paper knife, pen stand, coffee mug as pen stand, photo frames, table calendars, stress busters, table flags, idols, name plates, pen holders are common table top gift items. When the budget is big you can even plan to give a leather folder for the executives to keep in front of them. 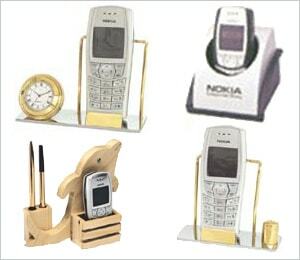 For senior executives you get expensive table top gifts which adds to the glamour of the spacious cabin. You get crystal vase for flowers on the table, mementoes, laptop stand, mouse pads, coasters, mobile stand, tab holder etc. as table top gifts. 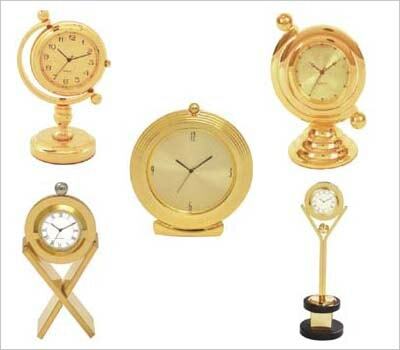 TABLE CLOCKS made of brass in shining golden colour with option of your logo branding on the dial in different shapes and sizes to suit your promotional needs. TABLE TOPS made of brass and wood with or without clocks and multiple clocks for global timings at a glance for relevant countries. 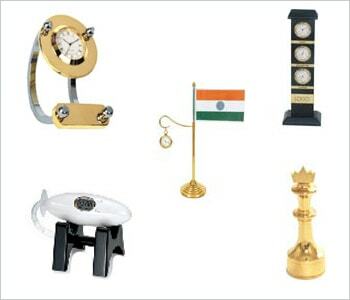 Choice of flags or king or queen of chess as paper weights to impress the recipients. 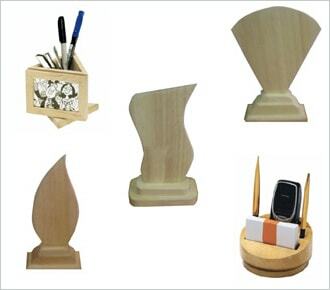 WOODEN ITEMS as table tops including pen stand, trophies, shield and awards with option of laser graving. 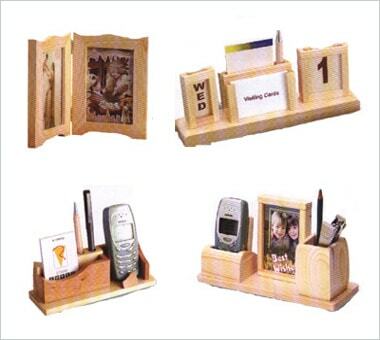 MOBILE STANDS as table tops with options of pen stand, clock, memo pads and visiting card holders. You can select from brass, metals, wooden, plastic and even combination of all the different materials as per your budget. 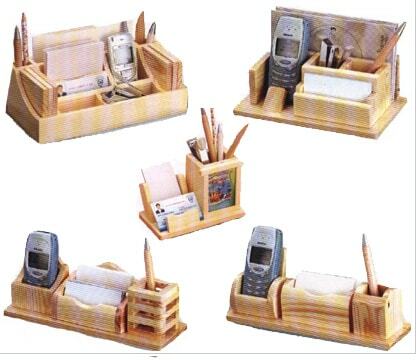 WOODEN TABLE TOPS with only pen stand to mobile holders, memo pads, clocks, frames, calendars, visiting card holders etc. with enough space for your logo branding preferably by laser engraving. Wide options to select the table top which fits your need and the budget.